The subject of the considerations set out in the monograph is to analyze changes in the pork market in selected countries in order to identify the problems and prospects of its development. A detailed analysis was applied to countries like: United States of America, Ukraine, Hungary and Poland. The elaborations presented in the monograph were prepared by scientific employees, experts from different countries, who in their research are engaged in demand, supply and consumption of pork. The importance of these issues is evidenced by the fact that pork is a basic species of meat in the food market and on a global scale there is an intense development of its production. A feature of the pork market is the variability of the market, growth of demand for pork, particularly in developing countries and the increasing intensification and concentration of production. Moreover, the pork market id characterized by the development of international trade, integration in the supply chain of pork, the volatility of exchange rates and emerging animal diseases such as porcine epidemic diarrhea (PED) and African swine fever (ASF). The challenge for pig producers is the higher demand for food, driven by growing population and high production costs, resulting from increasing fuels and energy, promotion of biofuels and weather risk. The most important criterion in economic decision-making becomes the maximization of economic efficiency. In addition, along with the development of world trade, the income of food industry largely depends on the success of the sales of raw materials in the international markets. Sanitary and veterinary standards often play the role of market protection tools. The development is targeted for a wide range of readers, because it has not only cognitive, but also practical character. Its analysis and conclusions may be useful for both producers of bait pork, entrepreneurs involved in the slaughtering of pigs and processing of pork, and decision makers that have influence on the shaping of agricultural policy in this market. I hope that the monograph will represent an immeasurable contribution to further research and development of solutions which ensure the development of live pig production in the world. In the regional perspective market information also covers communication between the entities operating in the system and is a carrier of new knowledge necessary to take specific actions. Authors of articles published in the first part stress the importance of promotional activities, including advertising, which are indispensable in creating the brand image of a region. The place image/identity has impact on the entire region and its components. The knowledge-based economy is also characterized by high spending on intellectual capital and information technology. However, the effectiveness of these processes requires the coordination of education, training and other information activities with the current needs of the changing economy and innovative and learning society. The use of new knowledge and innovative solutions is the subject explored in the second part of the publication. By developing bioeconomy, including the use of renewable energy sources through the implementation of the standards of social responsibility in business, as well as actions taken to protect the environment the regions are building their competitive position. Also rural tourism has become the area that uses new technologies and solutions. The third part of the publication describes actions taken to develop the potential of tourism. They include information and consultancy activities and diversification of tourism products. The problem areas presented in this publication do not cover all the issues relating to the concept of regional development in the knowledge-based economy. Nevertheless, the papers may provide a basis for further research, especially as the problem areas require continuing research of an interdisciplinary nature. 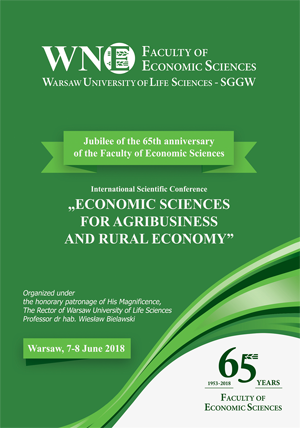 The publication introduces readers to environmental and natural resource economics, giving an overview of theoretical concepts andpractical examples of interactions between the human economic activity and the natural environment, as well as approaches to mitigate the contribution of economic development to environmental problems. In first chapter the authorgives definitions of thebasic notions, such as the environment, natural resources, and externalities. In the second – explainsenvironmental connotations (including natural resources depletion, ozone layer destruction, influencing climate change)of world’s economic development, linked withi.a. energy and natural resources demand growth, population growth, waste and pollution growth and increase of greenhouse gases concentration in the atmosphere. He introduces also the concepts of ecological footprint and economic sustainability. In third chapter, some theoretical views on global interactions between the human economy and the natural environment, including the Thomas Malthus model, the first report to the Club of Rome, Khan, Brown and Martel’ model, James Lovelock’s, Kenneth Boulding’s, Herman Daly’s, John Rawls’ visions and the concept of sustainable development, are presented.Fourth chapter contains an evaluation of the Pareto optimal level of polluting depending on pollution categories (flow, non-degradable stock, degradable stock), the Ronald Coase’stheorem and it’s critique. In fifth chapter an overview of economic instruments of environmental protection policy (i.a. fees and taxes, subsidies, deposits, market allowances) and criteria for their selection is given, with the ‘polluter pays principle’ and Pigovian tax mentioned. In sixth chapter, Polish environmental policy principles and financing sources (domestic, EU, EEA, Norwegian Financial Mechanism, World Bank and GEF) are outlined. Moreover, this policy instruments (pro-environmental subsidies; pollution-, resources extraction-, environment degradation-, deposit-, product-, administrative- and increased fees;special requirements; penalties as well as greenhouse-gas emission and energy origin certificates) are described. Selected economic consequences of introducing legal instruments for environmental protection are examined in chapter no. 7, with economic efficiency and the concepts of ‘government failure’, ‘market failure’ in focus. The author addresses consumption in the sustainable economy, referring to consumer ecological imperative, consumption dematerialisation, wasteful consumption, consumer’s responsibility and ecological education, in eight chapter.In the next one, he explains the notion of value of the natural environment and presents its selected measuring methods (hedonic price approach, travel cost method, contingent valuation method). Optimal exploitation of a renewable resource is reviewedin chapter no. 10. Optimal exploitation of a non-renewable, exhaustible resourceanalysis follows in the next chapter, introducingHotelling’s model, and a review of an efficient time allocation of a non-renewable resource extraction. In the final, 12th chapter, methods of including the economic interchange with natural environment into national accounting are studied. Selected indices of national welfare: GDP and it’s critique, Measure of Economic Welfare (MEW), Index of Sustainable Economic Welfare (ISEW), Genuine Progress Indicator (GPI), Environmental Sustainability Index (ESI), and Environmental Performance Index (EPI)are considered.